News: "There may be architects that can design better than me but the important thing is making it happen," architect John Pawson told Dezeen today, at the ground breaking for the new London Design Museum that he's designed. 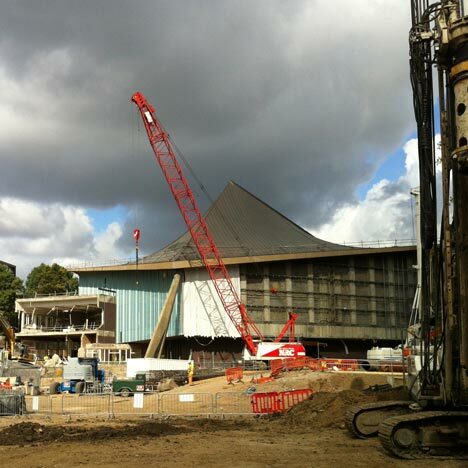 Due to open in 2015, the museum will be housed inside the former Commonwealth Institute building and will retain the building's hyperbolic paraboloid roof structure. "Architecture isn't just about creating new buildings, sometimes its about retuning what's already there," said Pawson. "Both are important as architecture." The Commonwealth Institute building was first completed by architects RMJM in 1962, but has been dormant for over ten years. Once renovated, the building will provide three times the exhibition space of the museum's current home at Shad Thames on the Southbank. Talking about his design, Pawson explained how the atrium will be central to the interior space. "When you walk in you'll be able to see all the way up to the roof," he said. "Now we just need to make sure what was drawn is what gets built." We published images of the proposals earlier this year - take a look here. A time capsule containing iconic contemporary objects nominated by Pawson and other leading UK design figures was buried on site during the ceremony.